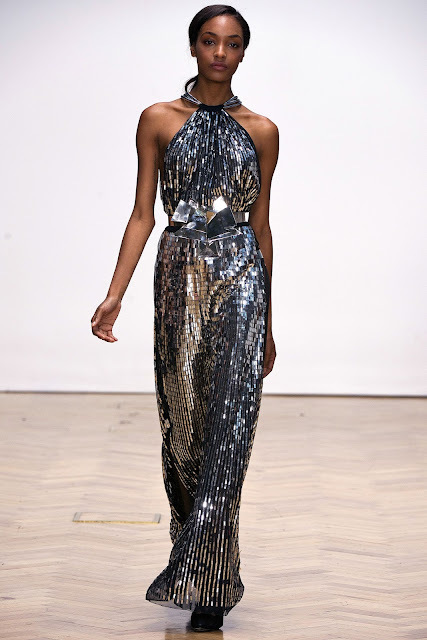 Sass & Bide's Spring/Summer 2013 collection was a modern romantic story of masculine meets feminine. Sharp tailored jackets, cravats and lace up brogues were juxtaposed with delicate feathered mini dresses, halter necks, flowing chiffon skirts and extremely heavy embellishment; all in a futuristic palette of black, white and gunmetal silver. Models continued the masculine notion with scruffy side parted ponies and 'barely there' make-up, giving the entire show that effortlessly cool vibe we've come to expect from London Fashion Week.